You are here: Home / Other / How to Delete Viber Message? Sometimes you have a conversation in Viber that you don’t want to see in future or you don’t want others using your phone see the messages. Sometimes we accidentally send Viber message to someone that you don’t intend to. Whatever be the reason you can always delete Viber?messages on your device, delete a message from the device of the receiver or hide Viber message so that only you can see the message using a secret code. These features on Viber has made it one of the secured platform to communicate private stuff with persons on your contact list. 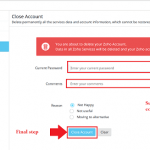 Or if you’re here to deactivate or delete Viber account, then follow Delete Viber account steps. Open Viber application on your device. Go to the Chat Tab among Chat, Contacts and Calls tab. Swipe down and find the sender whose conversation you want to delete. Find the individual message to be deleted. Tap and hold the message you want to remove. The options tab will pop up. From among the options tap on Delete for myself. The message will be deleted permanently. If you want to remove entire conversation of a particular person, go to the chat list then tap and hold the sender name whose entire conversation you want to delete and after that tap Delete in the pop-up option. If you sent the message to someone you had not intended to, You could delete the message before the person sees it. Just tap and hold the message that you want to delete?tap on Delete for everyone. The message will be deleted from your device and the device of the receiver as well. Open Viber messenger application on your PC or Laptop with Windows platform. You will see the list of the messages you have sent/Received towards the left side of the screen. Scroll down and find the sender whose message you want to delete. If you want to remove entire conversation made with the particular person, right click on the displayed sender name and click on delete. 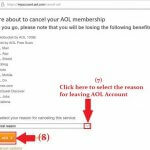 If you want to delete individual message left click on the sender’s name shown in the left panel, from among all the messages shared with the person (Displayed in the middle) right click on the message you want to delete and click on delete. If you want to delete the message you sent to an unintended person, right-click on the message and click on Delete for everyone. 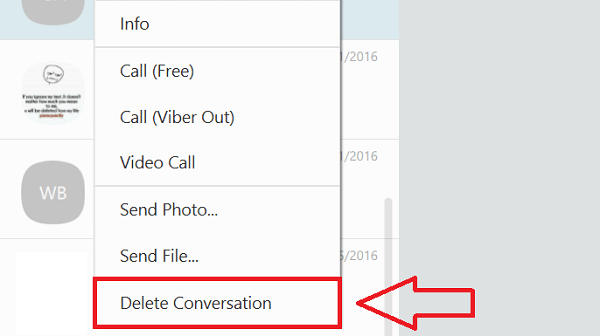 Once you delete a message from Viber, it will not be possible to gain it back in the normal course. However, these days, numerous third-party applications are available that can recover deleted Viber messages. So, be careful before you delete any message permanently from your Viber device. 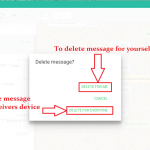 If you are deleting the Viber message just because you don’t want others to see them, however, you might need the message in future, and then Viber has come up with a solution. You can hide any messages in Viber. Open Viber application in your preferable device. Find the sender whose message you want to hide. 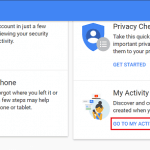 If you are using mobile or Tablet, then tap and hold the sender’s name, if you are using Computer or Laptop right-click on the sender’s name whose message you want to hide. 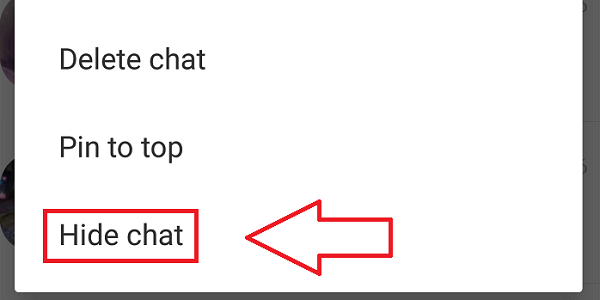 Select Hide Chat from the options. You will be asked to enter the pin code. 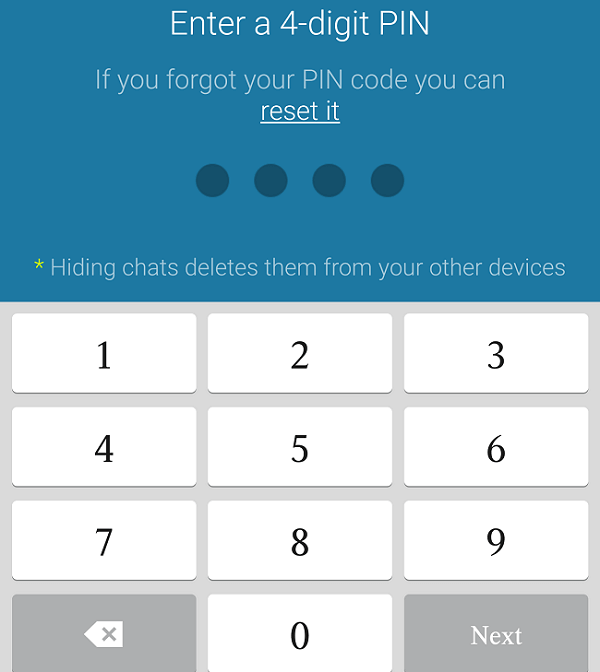 Insert the Pin code that is easy for you to remember and difficult for others to guess. Once you enter the pin code, your message will be hidden. The message will not appear in the message list anymore. Find the name of the person in the contact list whose message you have hidden. Tap on the contact and tap on Free Message. Then a screen will appear asking you to enter the pin code you have set for the contact. Enter the pin and the hidden message will be shown. Tap on the contact and then tap on Free message. Enter the security code, and you will see the message that you have hidden. Now tap on the settings at the top right corner of the screen. A drop down menu will appear. From the menu tap on Chat info. Swipe down to the end of Chat info page and then tap on Unhide this chat option. It will now ask you to re-enter the secret pin. Enter it, and the message will again appear on the message list.